This was most probably my first camera, in 1964. My sister discovered it this year while cleaning out cabinets in our family home in PA. I do remember that my first camera was given to me by my parents, that is was a metal box camera, that the format was 6 x 9, that it had two selections for instant or time, and that it took excellent sharp images. If this was the one, then it would be the camera that I used at the NYC World's fair in May of 1964, and it would be the one that I used in the Fall of that year, when I went away to school in Cassadaga, New York. And that it was replaced that Christmas with my Kodak Instamatic 100. I like the solid construction of this Pho-Tak, all metal instead of the paper, cardboard, and wood of most Kodak box cameras. And I like the shutter release and finder design. Lind's List says 1950 and that lens is f/11. Shutter speeds are printed on front of camera, 1/50, and Time. 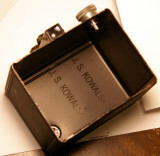 The stamped name inside is interesting... J. S. KOWALSKI can only be either my Grandfather (John) or my Dad's brother Joe. I loaded it with a roll of Kodak 160 film and took it to the Pevely Flea Market, which is in its final month of operation before closing FOREVER. Film was developed by Creve Coeur Camera, at their local lab. Negatives were scanned with my Epson Perfection 4490. The light leaks almost certainly prove that this was indeed my first camera, they seem familiar enough, and were a big reason for replacing the camera with another one for use in 1964. It may have been Dziadzia's camera. Maybe he gave to Tata when he went to war. I also remember TERI asking me if she should give you the camera.....flea market pics brings back memories like the carousel. Hi Ed, that camera is a family treasure. Hopefully your future generations will enjoy it. This is definitely a camera to keep forever! Lots of memories for you, I'm sure. Enjoyed the pics. What history with the cameras! Old is good, very nice pictures. Very nice to be able to observe the passing of one old friend with the rebirth of another. fade away...it has been the source of many fine photographs by your hand.